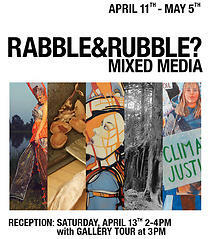 We are delighted to announce the opening of our mixed media group exhibit RABBLE & RUBBLE? at the Gibsons Public Art Gallery, 431 Marine Drive, Gibsons, BC. The art exhibition by ECUAD alumnae Penny Parry, Jocelyne Robinson, Kathy Kinakin, Deanna Fogstrom and Danaca Ackerson runs from April 11 to May 5, 2019. Fifteen photographs, sixteen paintings and two sculptural installations will be featured. The opening reception takes place on Saturday, April 13 from 2-4pm with an artist tour at 3pm. Refreshments will also be served. In addition, on May 5 a ”Meet the Artists” event from 1pm to 3pm is scheduled. Admission is free. In RABBLE & RUBBLE? two painters, Danaca Ackerson and Deanna Fogstrom, two photographers, Penny Parry and Kathy Kinakin, and sculptor, Jocelyne Robinson, have come together to explore the effects of changes to the places we inhabit. The rabble of human voices and messages of objects around us, speak out about changes in our natural and urban landscapes. The rubble refers to previously valuable materials used and discarded in de/construction and mis/management of the places we live.